Coating performance is proportional to the degree of surface preparation. Refer to the application instructions for specific primers and intermediate coats for application and curing procedures. Ensure epoxies are free from amine blush prior to overcoating. All previous coats must dry and free of contaminants. Adhere to all minimum and maximum topcoat times for specific primers and intermediate coats. 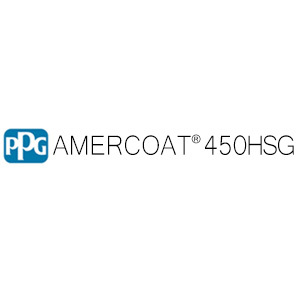 Aged epoxy coatings may require abrading prior to applying Amercoat 450H. Surface temperature must be at least 5°F above dew point temperature. Pre-mix base component with a pneumatic air mixing at moderate speeds to homogenize the container. Add hardener to base and agitate with a power mixer for 1-2 minutes until completely dispersed. Thin up to 20%, standard conventional equipment, 0.070” fluid orifice. A moisture and oil trap in the main line is essential. Product is sensitive to moisture contamination. The data contained herein are liable to modification as a result of practical experience and continuous product development. This data sheet replaces and annuls all previous issues and it is therefore the user’s responsibility to ensure that this sheet is current prior to using the product. The current data sheets are maintained at www.ppgpmc.com The English text of this document shall prevail over any translation thereof.